The high degree of dietary breadth and flexibility in capuchins (Cebus and Sapajus), coupled with their advanced cognitive abilities, is well documented. Owing to these characteristics, capuchins may be considered highly adaptable generalists, capable of occupying a wide range of habitats. The Panamanian white-throated capuchin (Cebus (capucinus) imitator) coexists with several other primate genera in Mesoamerica. Some taxa, such as the mantled howler monkey (Alouatta palliata) and Geoffroy’s spider monkey (Ateles geoffroyi), have broader geographic ranges than C. imitator. This may be due to historical biogeography (e.g. earlier colonization of the region by Ateles and Alouatta) or, alternatively, because some habitats may be less suitable for capuchins. We investigated the latter hypothesis using ecological niche models (ENMs) to predict range extent based on climate and elevation, as well as niche breadth. Our results suggest a narrow climate niche relative to the more wide-ranging Ateles geoffroyi, as well as Alouatta spp. Precipitation in the coldest quarter and temperature seasonality were the two most important climate variables for determining C. imitator habitat suitability. These findings may have implications for capuchins’ ability to persist through environmental changes (climate change and forest degradation, and loss) and warrant consideration in assessing their extinction risk. The online version of this chapter ( https://doi.org/10.1007/978-3-319-98285-4_15) contains supplementary material, which is available to authorized users. We would like to thank Tracy Wyman for assistance with analyses and figures. In addition, we wish to express our appreciation to the editors and two anonymous reviewers for helpful improvements to the manuscript. We are also very grateful to the organizers of the Festschrift conference, held in Banff, Alberta, on December 2–3, 2016, for the opportunity to participate in this wonderful celebration of Dr. Fedigan’s distinguished career. 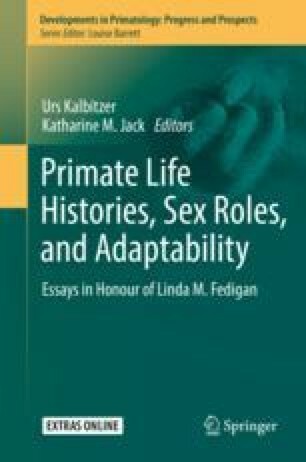 This paper evolved from discussions following various committee meetings, exams, and defences of several of Dr. Fedigan’s graduate students over the years and happily brought a lemurologist momentarily back to his capuchin roots. This is just one example of the great privilege and pleasure I (SEJ) have had to work with Linda over the past dozen years, and her intellectual inspiration long preceded that; I am grateful for her mentorship, leadership, and friendship.